The men’s winning time broke a 20-year-old course record set by Washington in the 1997 Cal dual regatta of 5:30.0. The women’s performance broke the 30-year-old record set by the Soviet Union national team in the 1987 Windermere Cup of 6:11.73. 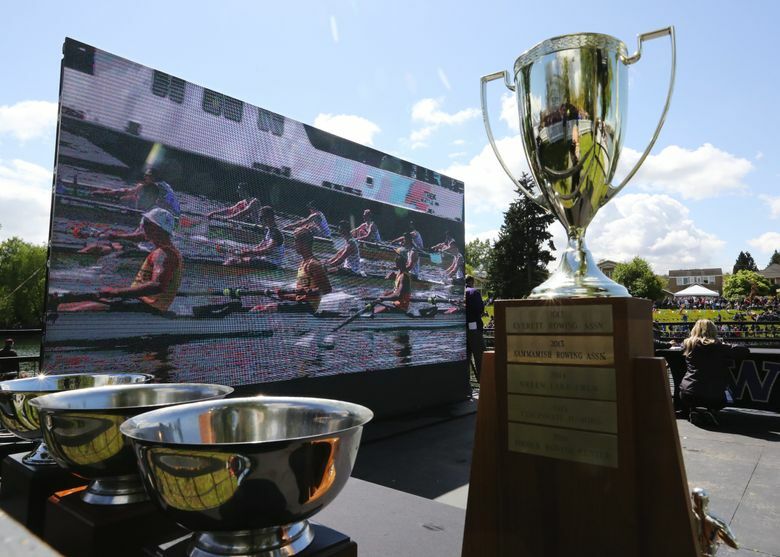 Sprinting down the Montlake Cut course as if they had motors instead of oars, University of Washington men’s and women’s varsity crews set course records Saturday in winning Windermere Cup feature races. The Husky men covered the 2,000-meter course in 5 minutes, 27.48 seconds, finishing far ahead of the Shanghai, China men’s team that was clocked in 5:45.36. The UW women won in 6:07.03. The Huskies’ second varsity eight was runner-up in 6:18.12, and the Shanghai visitors were third in 6:37.23. The course that starts on Lake Washington then enters the Montlake Cut has been used by UW rowing teams since the 1970s. The impressive performances come two weeks after both UW varsity boats lost to archrival California on the Montlake Cut. The Huskies get a chance for revenge next weekend at the Pac-12 championships on Lake Natoma outside Sacramento and then will see the Bears again at national-championship regattas. The UW crews benefited from a huge partisan crowd on hand for the Seattle spectacle of the Windermere Cup Regatta followed by the annual yacht parade to herald the opening of boating season. Men’s coxswain Stuart Sim said the perfect racing conditions of a cool temperature (low 50s) and negligible wind combined with the enthusiastic crowd as factors in the victory. “The crowd certainly got us through the last 500 (meters),” he said. “It was the crowd that got the record.” The quest for the record was the only suspense left in the race after the first 1,500 meters as the Huskies led by 19 seconds. Farooq had made five changes in her varsity boat since the loss to Cal, where the Bears had taken over at 1,000 meters. “We’ve been working really hard on a complete race,” Farooq said. She got it Saturday. UW men’s coach Mike Callahan promoted Dutch freshman Bram Schwarz to the varsity stroke seat and had Swiss senior bow Gugliemo Carcano switch from port to starboard for the race against the Shanghai rowers. Women’s varsity coxswain Phoebe Marks-Nicholes said the Huskies didn’t know what kind of competition the Chinese would provide and concentrated on rowing well instead of worrying about the opponent. 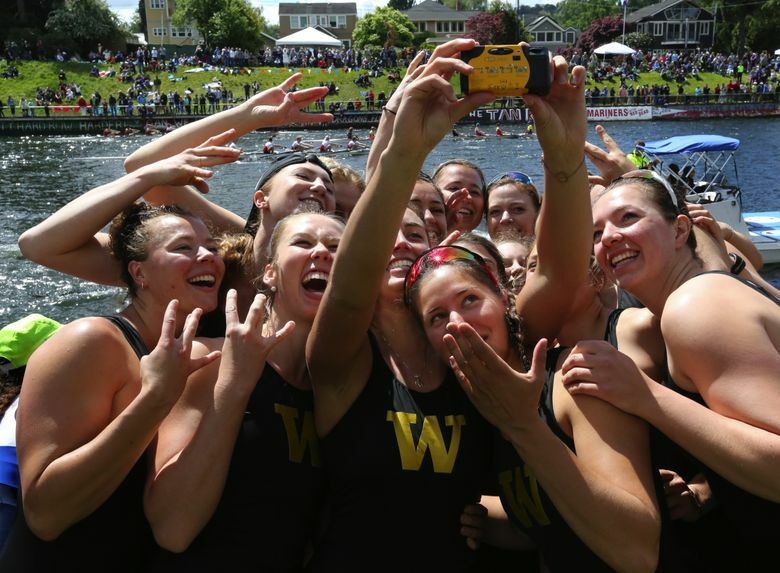 She said the UW second varsity eight “pushed us,” especially early in the race. Marks-Nicholes said it was special to set a record on a day when some other Washington crews of years ending in “7” were honored. UW men’s and women’s crews of 2007 won national championships and the 1977 men’s crew was victorious at the famous Henley Regatta in England. In addition to the UW varsity boats winning, Husky entries won every race in which they were entered and did it by open-water margins. • This was the third time a crew from China has been the featured foreign opponent. Crews from 17 nations have been featured opponents over the years.